For as long as I've been into craft beer I've wanted to try this beer! 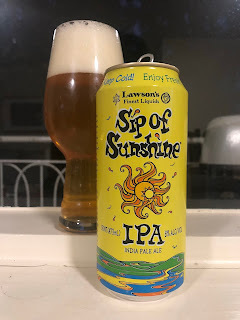 Sip of Sunshine from Lawson's Finest Liquids, one of the great names in brewing, has always been on my bucket list. I'm not 100% sure why, I'm guessing it had something to do with the striking predominantly yellow can. I always thought I would have to travel to the U.S. to try this beer. Lawson's have a tiny distribution footprint in just 7 North Eastern States (Vermont, Connecticut, Massachusetts, Rhode Island, Maine, New York & New Hampshire). Then magically up stepped Sydney's premier beer store, Bucket Boys, with their 2nd Anniversary sale. They got a heap of hyped stuff in super fresh and put it on sale. Demand was understandably high, but I managed to secure what I wanted. 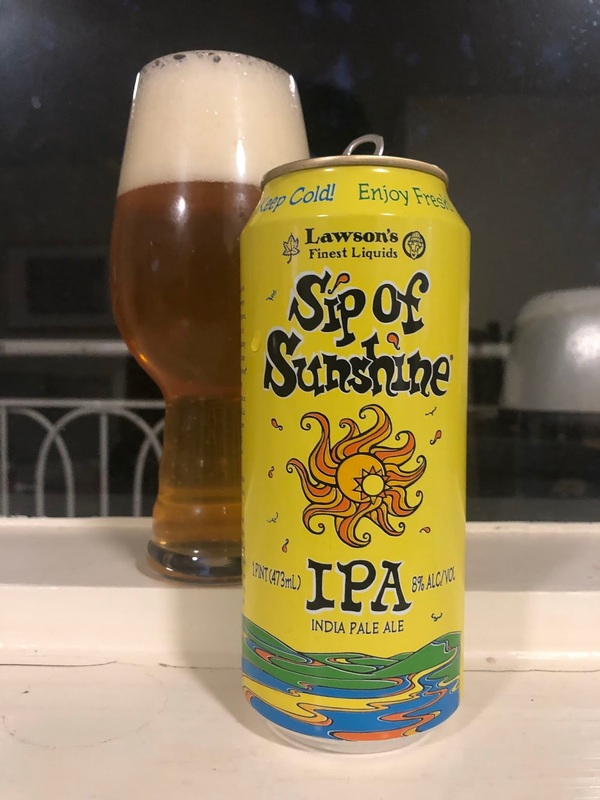 Lawson's Finest Liquids' flagship beer, Sip of Sunshine, pours a deep golden colour and is slightly hazy. The beer pours with a big off white head, maybe 3 and a half fingers high. The top of the head dissipates quickly however at least half a finger of head is left covering the beer throughout the course of drinking. This is aided by the continual rising of a number of fine bubbles from the bottom of the glass. On to the nose and the beer smells like a tropical fruit bomb. There is heaps of mango, pineapple & papaya up front, before stone fruit & citrus flavours take over with nectarine, peach, grapefruit & orange peel all evident. It's one of the most complex mix of hop aromas that I've ever smelt. There is very little malt on the nose, with a touch of bread noticeable. The flavour follows on from the nose - there is plenty of tropical fruit & citrus flavours with only the faintest hints of bready malts, which provides balance. The dominant flavours I pick up are mango, grapefruit & peach. The hop flavour is reminiscent of a NEIPA, with plenty of juicy fruit notes, however it has a good whack of bitterness, which is a wonderful change up in this age of juice dominant NEIPA's. Given the ABV, this beer is dangerously drinkable.